If you’ve been following Ethical Jewellery Australia (EJA) for any length of time, you’ll probably have noticed we always (and I mean always) mention that the precious metals we use in the jewellery we make for our customers – gold, platinum and palladium – are recycled in origin. It’s not just because we’re good little recyclers and don’t like seeing things go to waste. There’s a whole lot more to it than that. This year most of our customers have been preferring platinum and palladium. But when we do make a piece of gold jewellery, the gold itself comes from one of only two possible sources. Almost exclusively it’s recycled in origin, though we do offer fair trade gold as an option. Outside our little neck of the woods however, there is another possibility. Most manufacturing jewellers use mined gold, or what might be called ‘primary gold’ (that isn’t fair trade in origin). Let’s take a quick look at each so you can appreciate why we’ve made the choices we have. Primary gold is gold that has been dug out of the ground and is sold as an un-branded commodity. It could just as easily have originated from an open-cut mine in Australia or have come from an illegal artisanal mine in Angola. It might also have been used to launder drug cartel money out of South America, or it might be squeaky clean. For the most part, because the supply chain is so porous, there’s no way of knowing at the consumer level*. *The gold mining industry is taking steps to change this – with what’s being called “mine to finger” traceability, using Blockchain technology. This development however is still in its early days. Similarly, the Alliance for Responsible Mining (ARM) and RESOLVE have developed a code of conduct (called CRAFT) to facilitate the entry of small-scale mining operations into the market. For above-ground operations, one that process less than 100,000 tonnes of earth per annum. Medium- and large-scale mining is everything else – open-cut or below-ground. Medium- and large-scale mines tend to be highly regulated and capital intensive with a relatively small labour input. ASMs range from formal (licenced) operations to informal and illegal mines. They’re mostly found in developing nations where they’re largely labour-intensive, pick and shovel type operations Often using an exploited workforce that can (and often does) incorporate child labour. As it is with most fair trade products, the primary objective of the fair-mined gold movement is to improve the lives of ASM communities by ensuring workers get paid a fair amount. Also that their working conditions are safe, that they carry out operations responsibly and child labour is eliminated. Moreover, communities with fair-mined gold certification also (typically) receive production bonuses. These can amount to several hundred thousand dollars to aid with local community development each year. Workplace deaths and child labour are common, slavery and human trafficking are real, as is conflict funding and criminal corruption. Pay rates for miners are often barely subsistence. And long-term damage to the local environment and community health (particularly from mercury pollution) is endemic. And the biggest problem is, due to a lack of economic development, most people in these communities have little if any other choice if they want to survive. 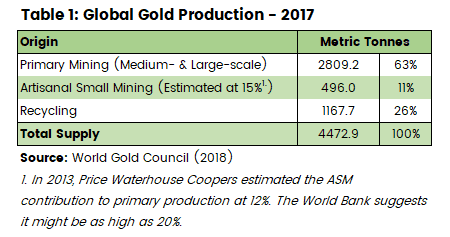 As you can see in Table 1 above, recycled gold contributed around about 26% of global production in 2017 and has sat at around 25-30% since the mid-2000s (World Gold Council – 2018). What we like about recycled gold is its vastly smaller contribution to greenhouse gas (GHG) emissions (primarily CO2) than does mining. It’s true that recycling (re-refining) takes place almost exclusively in developed countries so it doesn’t directly benefit ASM communities, but it does benefit everyone to some degree. Table 2 (below) shows what contribution the various gold production stages make to overall GHG (CO2equivalents) emissions. Note that the refining step – which is the only step involved in recycling – makes a considerably smaller contribution to greenhouse gas emissions than the preceding ones. Of course, this only has some meaning if you have some context in the form of quantity of greenhouse gases. In its 2018 published report; Gold and Climate Change: An introduction, figures obtained by the World Gold Council indicate that gold production yields an estimated 38,100 tonnes of CO2e per tonne produced. Let that sink in for a moment … that’s 38,100 tonnes of CO2e for every 1 tonne of gold produced. As you can see in Table 3 above, despite making up 26% of the global supply, recycling contributes less than 0.2% of greenhouse gas emissions. This is why EJA is very much in favour of using recycled gold. Climate change affects everyone, no matter where you live. The recycling sector has come under scrutiny in recent years because of a thing called ‘green-washing’. This is a process by which illegally or unethically sourced gold (often from illegal artisanal small mining, from production theft and criminal money laundering operations – United Nations Inter-regional Crime and Justice Research Institute, 2016) enters the supply chain as “scrap” before the refining process to then be on-sold as ‘recycled gold’. Thus converting illegal material into ‘legal’ product. Often quoted is the instance of a large Dubai-based refiner being caught handling untraceable gold, dealing with suppliers into conflict regions and otherwise behaving unethically. In turn this tainted the global recycled gold supply chain. Green-washing is undoubtedly a problem, but it’s no justification for abandoning recycling. As it is with many things, it becomes a matter of choosing your suppliers carefully. At EJA, we recycle our own waste, recycle some customer’s jewellery where appropriate and otherwise get our recycled gold from Precious Metal Technologies (PMT). PMT is a Queensland-based refiner that only uses verifiable sources of scrap gold (principally old jewellery and dental and jeweller waste). Otherwise we us Hoover & Strong, a US-based eco-refiner – again with verifiable sources of scrap. Fair-mined gold or recycled gold – which is the ethical choice? Recycling gold is nothing special because ‘recycling is standard practice in the jewellery industry’. So you, as a consumer, should not rank companies that promote the use of recycled gold as being any better or more environmentally responsible than anyone else. These arguments are only partially true, and they shouldn’t be taken at face value. The graph below shows the movements in production and demand for gold since 2010. After a spike in demand for gold in jewellery in 2013, demand has since dropped by 22%. Demand for gold in jewellery has not influenced primary production over the past 5 years or so. So, what does all this mean for the fair-mined gold movement’s assertion that recycling has not reduced primary gold production? And from that the promise that recycling will reduce the amount of environmental damage? Oxfam’s No Dirty Gold campaign first raised consumer’s awareness that gold mining was not doing the planet any good back in the mid-2000s. The focus was on pollution and habitat destruction. The belief then (and reasonably so) was that if you scale up recycling, there’ll be a reduction in primary demand. This was a rational argument but, with the benefit of hindsight, it turned out to be somewhat naïve. The harsh reality is there would have to have been a drastic (if not catastrophic) reduction in the price of gold for mining development to slow down. Then why bother with recycling? 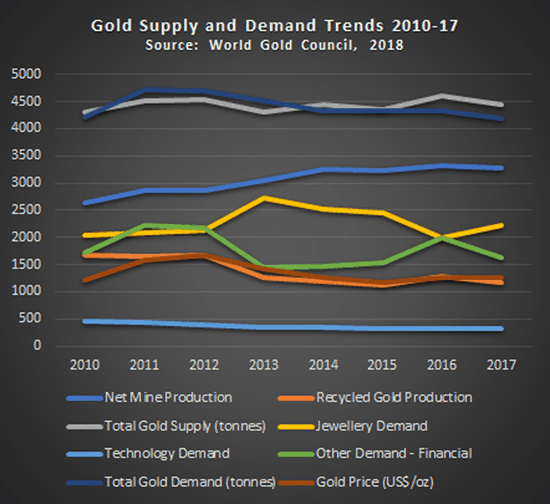 If it’s true that recycled gold ‘fills the gap’ between primary production and total demand, then we would argue it has contributed significantly to moderating gold prices. Hence, it has mostly likely reduced the rate of primary mine development. Had not recycled gold plugged the average 1,380 tonne per annum production gap between mined supply and demand, then who knows by how much gold prices would’ve increased and by how much primary production might’ve grown? What we can say is that if that 1,380 tonnes of recycled gold were replaced by primary gold, then we’d be looking at potentially an additional 52,580,000 tonnes of CO2e being pumped into the atmosphere each year. So, despite recycling not delivering on the hope of reducing primary production, it has most certainly contributed to significantly reducing GHG emissions. As for the green-washing issue. Again it’s a case of suggesting we should throw the baby out with the bath water. Criminal activity by a few (that was discovered and prosecuted by the way), does not make recycling a bad thing. It just means the supply chain needs to be made more secure across the board – as is the case with all primary mining. At EJA, we choose our suppliers very carefully to make sure the scrap they use comes from verifiable sources. And lastly, to suggest recycling is nothing special because ‘everyone does it’ is a misdirection. There is a big difference between recycling internally-generated waste and buying recycled raw materials. It’s absolutely true that pretty much every jewellery manufacturer, large or small, recycles their waste precious metals. But it’s not a closed loop. Manufacturers cannot magically produce gold (or any other precious metal) out of thin air to replace that which they sell. Every jewellery manufacturer has to buy in more gold so they can produce more jewellery. It’s where that gold comes from that counts! In short, using recycled gold to manufacture jewellery is not really “standard practice” as some would have you believe. In fact, it’s probably more the case that most manufacturers use a mix of whatever is the best price at the time. Using recycled gold exclusively is most certainly not standard practice. But even if it were, it should still be applauded and valued! When it comes to fair-mined or fair trade gold vs recycled gold, we don’t think it’s our business to tell you who you should or shouldn’t support. We think both have their good points, but ultimately it’s your choice. There are other ways to help communities in developing nations beyond mining. It’s true that for individuals in many ASM communities, mining is their only real option in the medium-term. However, we’re inclined to support organisations (like Pact and World Vision) that also work to develop a more sustainable future in developing countries by providing education and training, health services, infrastructure and local industry and agricultural development. Every little bit helps, but what matters most to us is that you get to make an informed choice. As we said at the outset, our first choice is locally recycled, but we’ll happily support you if your preference is fair trade gold. You might also want to read our article about choosing the right metal for your rings.